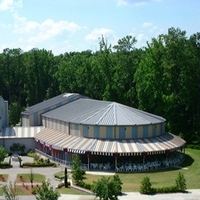 The Miriam H. and John A. Conant Performing Arts Center, completed in 1997, is a four-story, state-of-the-art theatrical and performance facility providing a permanent home to Oglethorpe University's Theatre Department and Georgia Shakespeare. Parking: Free parking is available. MARTA: Take the Gold Line to the Brookhaven/Oglethorpe station and walk north on Peachtree Road NE. Oglethorpe University will be on the left.